Last week we published an introduction to our decentralized RNG, a feature that our team has been dedicated to perfecting and are just about ready to release. Before diving into more details, we want to hear from our community! 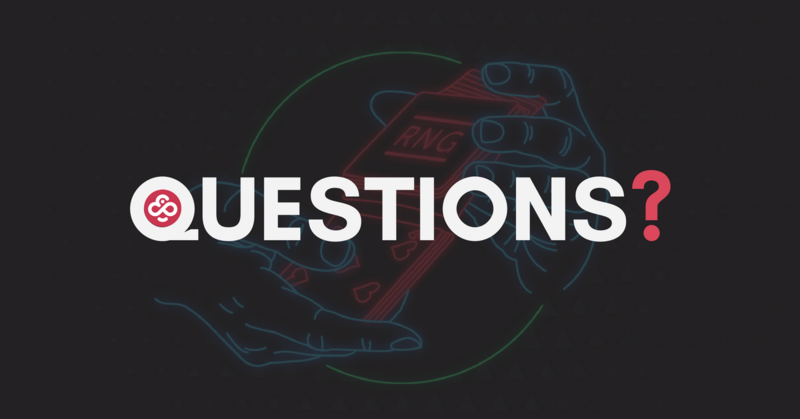 We invite you to comment below with any questions regarding our revolutionary take on a card shuffling system. Once we’ve gathered your responses we will be putting together a Q&A session with Chief Technical Officer, Justas Kregzde. Go ahead and ask away! Almost seems too good to be true given that most online poker sites juice their RNG to generate rake. If only you add support for other crypto currencies or make chp buying easier and faster. Is it possible you still haven’t noticed that, with the free rolls, hand-for-hand goes way before we reach the money? It goes hand-for-hand with 26 players remaining but when one busts hand-for-hand is over, despite nobody being on the money yet? Like, WTF??? Thanks for letting us know, although these comments were intended for RNG related questions. I will pass this information on to our tech guys to look into, we appreciate the feedback. Is it true that on websites like Pokerstars the RNG is constantly shuffling the deck of cards between all the different streets, while action is still being determined, unlike when playing at a land based casino the dealer just holds the shuffled deck? I actually had a chat with some of our team members about this question – was curious myself. Based on the input, which also comes from former PokerStars employees, the standard is always that the deck is shuffled before the hand and not after each street. Next Post The Hand Off Continues: Now Boosted to 50,000 CHP in Prizes!